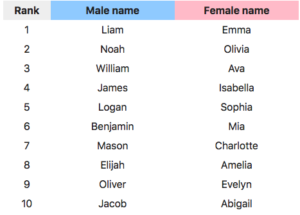 The Social Security Administration has recently released its annual list of the United States’ most popular baby names and one thing is clear: American parents love vowels. Continuing an on-and-off reign that began in 2008, “Emma” took the top slot for newborn girls’ names. “Liam” became the most popular name for boys for the first time ever. 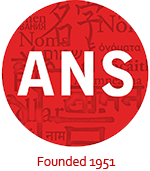 Both, notably, have a 1:1 ratio of consonants to vowels. This is true up and down the list: Vowels accounted for at least half of the letters in all but one of the most popular girls’ names (Charlotte). Boys’ names are slightly less vowel-heavy: They make up at least half of the letters in four of the 10 most popular boys’ names, but many of the rest are close, with just slightly fewer vowels than consonants. Want to know more about this trend? Click through to this article at the Atlantic for details and analysis!